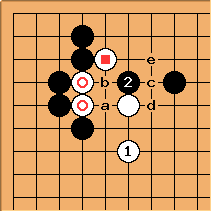 If is present, it is very dangerous for White to mindlessly play the small nadare. What can Black do now? 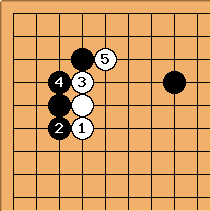 Bill: Is there any version of the small nadare White should play in this situation? Charles You mean any version of the nadare, period? Bill: I would not be inclined to play nadare, myself. But the text, by its specificity, suggests that there is a version of the small nadare that is OK. 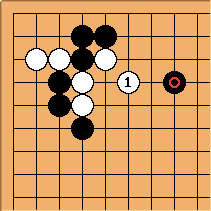 I doubt it, but I do not keep up with joseki. Charles But Bill, the small nadare is Black's option. Charles That's what I'm saying. You don't mean White shouldn't play the konadare, you mean White shouldn't play nadare. Bill: I am asking a question, Charles, not making a statement. (OC, the question carries a suggestion.) It is true that I would not think of playing nadare here. However, the original author specified a particular variation of the small nadare. How come? Would another variation of it be OK? Anyway, I am altering the diagram to show the large nadare. unkx80: Why should White play nadare in the first place? And ask here what White's best play is. 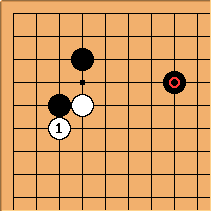 This is a reasonable sabaki exercise. 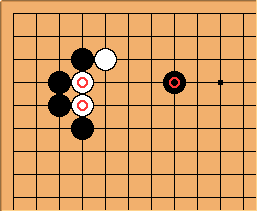 I suppose Bill may be asking whether White's best play is a recognised joseki variation, or whether it deviates. For example, White at a might be good here, but not a real joseki. dnerra: In my mind, White has already lost when he followed up to this diagram. 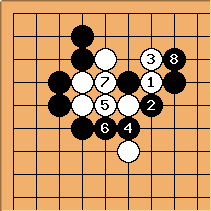 This is really bad shape for White, and the only excuse for allowing this bad shape in the usual small nadare is the fact that the cut at b works so well tactically (basically it either captures the black stone at the top or the two stones on the left). Here, when this doesn't work, there is no escape from bad shape. 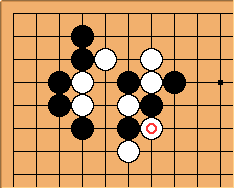 If this happened because I was drunk during the previous two moves, I would prefer tenuki or resign to any rescue attempt that will just lead to bad damezumari-like shape with a heavy group -- I would hate it. Charles Really that bad? is shape, can take the bulge point. But now White can find something? For example, here, with three aims. dnerra: here is really nice, yes, and it's not as bad as I made it above. 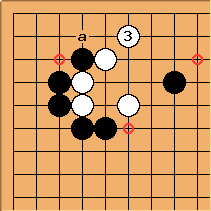 Even so, I doubt it can be considered a success for White after Black descends to a. 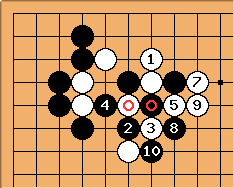 It depends on the full board position, of course, but while White will do damage to the top, the black corner has become really huge. 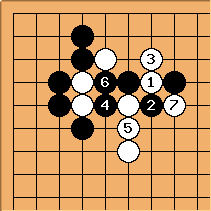 Black has a huge corner already, and White' group still looks heavy to me. Charles Yes, Black has other ways to play with . Bill: White is heavy. The exchange of the and stones is not good for White. Charles I suppose White makes the most of it with . 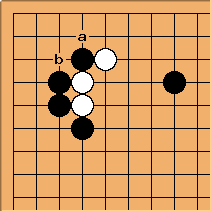 Then Black a, White b is Black's prerogative, and prevents White c. This and subsequent play will depend on the top side, and how much trouble gets into. 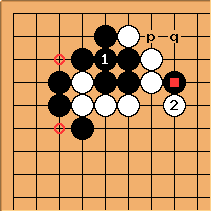 Black p looks premature while White q is effective. So White might manage to treat the stones lightly. On the other hand the clamp at the circle point remains for Black and is quite serious. Bill: Hmmm. I think that is the reply that keeps White heavy. If White saves both the stones and the stone, sooner or later she will have to fill at a and b, making a nice dumpling. Charles Bill's play is severe. Fighting spirit seems to say White answers at c, hoping for the best and a good ladder. Charles Black should probably answer e, if the ladder is good for White. 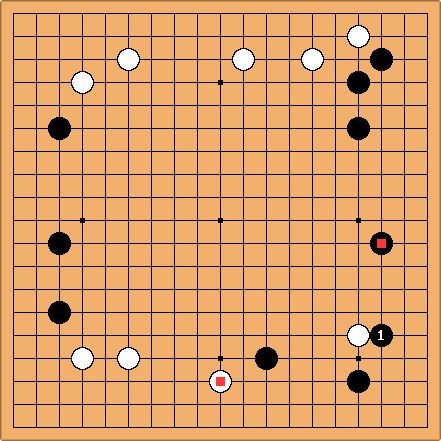 White is happy to give up the rubbishy shape of the stones, for the outside. This is what I'm on about. 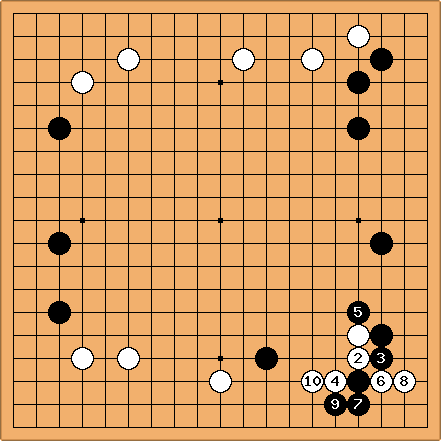 Bill: Black's previous play ( ) and give White a chance to sacrifice some stones. White has come out of this pretty well, I think. Bill: I agree that most of this discussion deserves its own page, but there are a number of lessons to be drawn from it. Mostly it is about a particular difficult situation for White, how White can make the best of it and how Black can exploit it. Charles I made five points on The Basics Of Fuseki/ Discussion, which were immediately rubbished. This position seems to cover in some way much of what I said there. So, yes, more than one point to draw out. Bill: One piece of advice you give there is Don't play any substandard plays. One source of substandard play illustrated here, I think, is getting drawn into small-scale fights over a few stones. 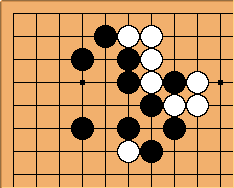 If Black attacks too closely, White gets the chance to recover via sacrifice. Several variations illustrate that. In this small avalanche position the stone gives White difficulties. In addition, the stones are heavy. How can White handle this situation? How should Black attack? With minor edits, the material between A and B could go on that page nicely. Projecting the play forward a bit, we may get the next diagram. Let's suppose we get the exchanges, - and then - . White has sacrificed 5 stones, so let's do a tewari and remove corresponding stones. This looks like a pretty reasonable exchange. 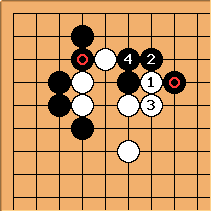 Black has a huge corner, but Black has invested 2 more stones than White. In addition, maybe Black is even a little overconcentrated. OC, this tewari is far from exact, but I think that it is clear that White should be thrilled to get the chance to sacrifice her heavy stones. Bill: I think that Black can be more than satisfied with - . 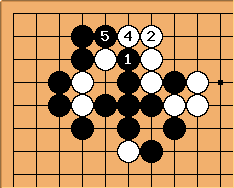 Black started off with the two stones. What has White accomplished? Indeed, Black is better off now. 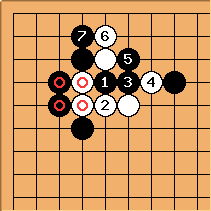 White is in no hurry to save his heavy stones and needs to tend to his central group. Bill: So I think that maybe is the shape play here. Ian: I was wondering if Black 2 could just be like this? Or is this nice enough for white because he just lives outside as it where. Charles White is quite keen to get this sort of result, with a blighted stone. 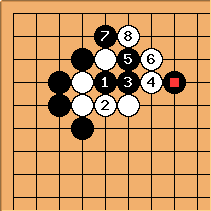 Black has played himself into a driving tesuji. This end result is fine for White. 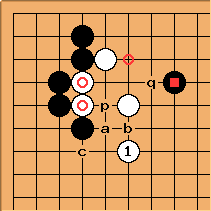 White at p or q later sets up the two marked cutting points again. Black has lost it. This is from a pro game, with and to add in. After , White did go for the nadare. Bill: Thank you, Charles, for this wonderful pro example. :-) As always, the surroundings matter. Thus. This at is the other major variation of small nadare; see small avalanche.